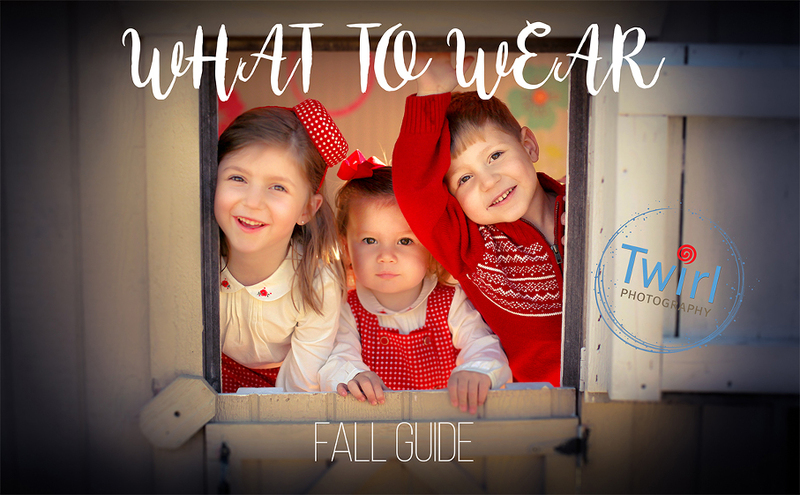 Need a Little Wardrobe Inspiration for Your Fall Photos? I’m here to help. The truth is that it’s worth the hassle. A beautiful family photo will be around much longer than the memory of the struggle. And if you invest a little time into preparation, the results can be stunning. I am a big fan of families being themselves, especially in a city like New Orleans where being unique is part of the culture. Keep your own family in mind as you look at the inspiration below and find your style. 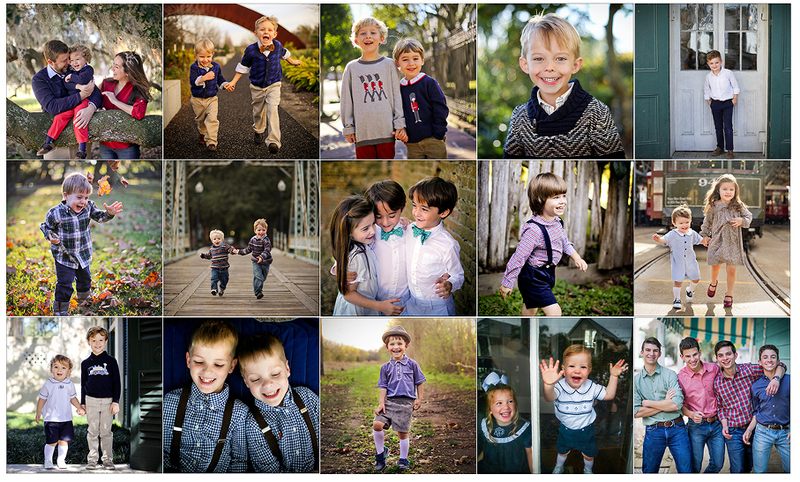 I hope these tips help create a less stressful lead-up to your family portraits this fall. If you haven’t already reached out, make sure to email me to schedule your fall session! 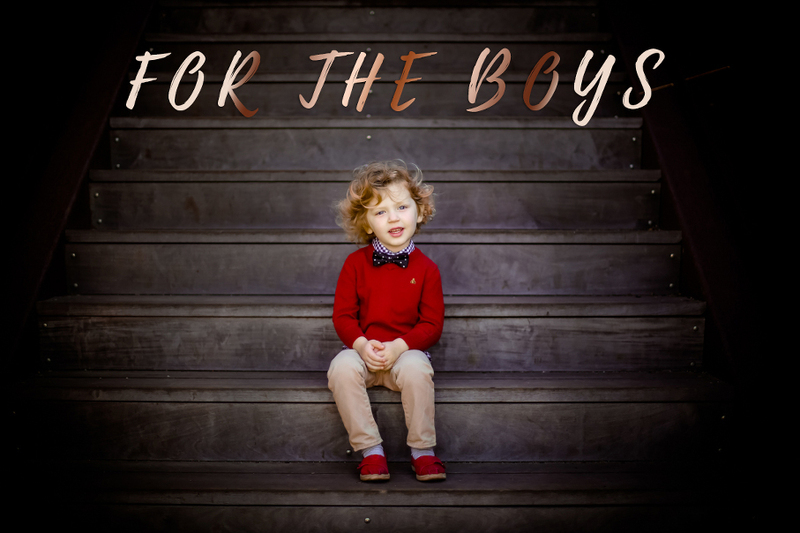 For the Boys: Boys can be hard to shop for. There’s an endless supply of cargo shorts and printed tees, but finding something timeless for a photograph can be tricky. Thankfully, the cooler weather gives us more options on style. An added sweater, jeans or cords can provide texture. Like dad, polo shirts and dress shirts with rolled up sleeves work well. You can add a jean jacket or light coat for layering. Accessories such as a bowtie, hat or suspenders can also add some flair, if they don’t become too distracting. Some of my favorite stores for boys include Pippen Lane, Zara (coming soon to Lakeside) and for something classic, Banbury Cross. For the Girls: This one is so fun! A ton of cute outfits are available for girls, both casual and dressy. Staying in the fall color pallet—plums, burnt orange, mustard and creams—can be lovely. Copious amounts of shiny and sparkly clothes are out right now that look great in photographs, so bring on that gold shimmer! For feet, ballet slippers and Mary Janes are timeless, while a pair of classic high top sneakers can be playful. If you have more than one girl, dresses that match or coordinate can be eye-catching. Special tips for girls: Make sure hair is out of eyes, and don’t forget the bloomers or monkey bar shorts! We will be moving and jumping around for the perfect photo, not always sitting in a lady-like position. It’s good to be prepared. For the Dads: Dads should look put together. This can be either in a casual or dressy way. A sweater or coat in the Fall with a pair of nice jeans or slacks. Men look great in fall colors such as gray, auburns, mustards and plums. Like the boys, a bow tie or hat can be a fun accessory if it fits his style. Stay away from T-shirts. They often look ill-fitting, and logos are distracting. A dress shirt with rolled up sleeves, or a polo shirt, is a solid choice. And don’t forget to wear good shoes. Most importantly, dad needs to be comfortable and ready to chase his kids. For the Moms: Don’t be an afterthought! Take time to wear something that makes you feel beautiful and feel like the awesome mom you are. Get ready before your kids, if needed, so you don’t run out of time while trying to run out the door. In the fall, scarves and sweaters offer a variety in the images you’ll create. And if your kids spills something on you – we have options. Picking your outfit first can set a great foundation for the color scheme and cohesiveness of your whole family. Go dressy with heels and your favorite dress. Or casual with jeans and high boots. Don’t forget jewelry and lipstick! For the Babies: Classic rompers with delicate embroidery or a sweet onesie is all you need to celebrate those baby rolls. This is the perfect time to put on that heirloom lace hat. For walking babies and toddlers, white knee-high socks look adorable. Bubble rompers are also the perfect way to celebrate those chubby thighs! One tip, don’t stress over baby shoes. Let those little toes wiggle, as babies will generally be held or sitting. If it’s cooler outside, soft baby booties can be fetching. Don’t match, coordinate! Cohesiveness of clothing is the goal. Start with one outfit and build out from there. Think about your color scheme, and don’t be afraid to add a few bright colors, pop of stripes, plaid or other simple patterns. Think about your location and how it relates to the clothing. Parks are great for sweaters, scarves and textures. Urban settings are perfect for a more modern look. Open fields at sunset are great for those flowing dresses on mom and lighter colors. Pay attention to the size of clothing. Put your kids in the clothing size they currently wear. It canlook awkward in photos if they’re swimming in their sweater or wearing something too small. One last thing: Be you! Choose something that looks like your family, and you’ll love looking back on these images for years to come. We’re lucky to have so many wonderful children’s boutiques in New Orleans that curate delicate, fun and timeless threads such as the ones below at Peony on Magazine St. A quick shout-out to a few of my favorites: Pippen Lane, Little Miss Muffin, Banbury Cross, Peony and Mignon. This picture will be on your wall for, hopefully, generations. Don’t be afraid to shine!